Given the success of the Tap Room opening at Indeed Brewing a few weeks ago, I doubt don't that the Opening and Ribbon Cutting of its home, the Solar Arts Building, will also be met with great fanfare next week. 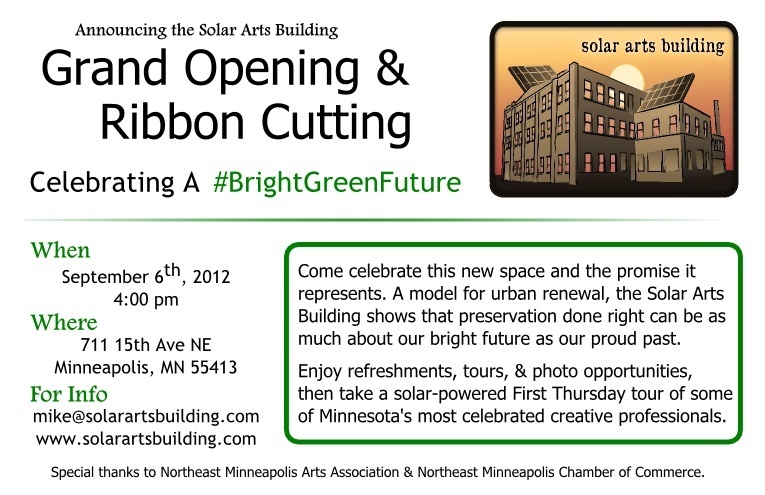 Drop in for refreshments, tours, and to celebrate the promise of urban renewal and a #brightgreenfuture for Northeast Minneapolis! Please join us for the celebration of a #BrightGreenFuture - Our entire community worked with us to bring this historical piece of Northeast back to life. Now the Solar Arts Building is yet another valuable component to the Arts District, our epicenter for the "creative class." We certainly hope you can make it to our Ribbon Cutting Event! 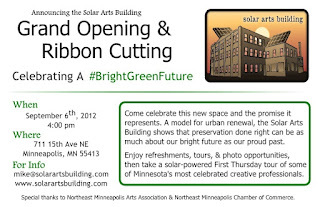 A fun twist on the classic ribbon cutting ceremony, the public event will celebrate urban renewal, Northeast Minneapolis, and the Bright Green Future that lies ahead. At the Solar Arts Building, we appreciate all the support and warmth that has come from our neighbors in the Northeast, and our brothers and sisters in the Minnesota arts community. That is why we would like you to come celebrate not just this new space, but the promise it represents. A model for urban renewal, the Solar Arts Building shows that preservation done right can be as much about our bright future as our proud past. Enjoy refreshments, tours, & photo opportunities, then take a solar-powered First Thursday tour of some of Minnesota's most celebrated creative professionals. Food Truck will be available.